Ai – Harmony, unity; balance; to be in accord or to join with. Ki – Spirit; life- force; universal creative energy. Do – The way or path. 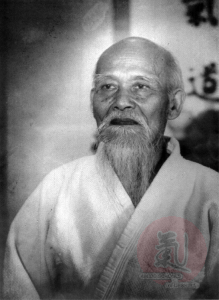 The study of Budo and the development of Aikido was the life work of Morihei Ueshiba O Sensei (Great Teacher), a figure of great renown who traveled the length and breadth of Japan studying under the greatest masters of many arts. Hard work, severe discipline and all the money he could earn were poured into his mastery of the sword, the spear and the arts of self-defense. Deeply interested in the study of spiritual thought, he had also practiced many different spiritual disciplines. Yet he was unable to unite his spiritual beliefs with his physical accomplishments. A short time after returning from military action in the Russo-Japanese War, he retired to a small house located on a mountain outside his village. There he lived and studied silently; his days spent training his body and his nights spent deep in prayer. It was at the end of this time of severe training that he had the realization he had been seeking all his life. At that moment nature’s process became clear and he knew that the source of Budo is the spirit of protection of all things. Morihei Ueshiba intimately recognized and understood the harmony and power of the creative process form which all things evolve. His art was the sword; his creative way was Budo. His understanding and enlightenment is creatively expressed by the protection of all life through a powerful and graphic application of universal truth. Aikido is creation, not destruction. It is a positive energy which creates harmony and justice out of violence. To talk of harmony and justice is simple. But to apply those principles to the conflicts which we face everyday requires a deep understanding and sincere trust. Logic may tell us that truth lies within the process of harmony, but the moment something of value rests on the outcome of a situation we no longer trust that logic. The beautiful ideas and eloquent phrases are forgotten under the pressures of reality. In philosophy a theory of truth is expressed in words, but the truth of Aikido is expressed in action, the theory proven in practice. By the physical application of its principles we develop a deeper understanding in the heart instead of the mind. Through practice and experience, we learn to trust its power. Aikido training is to challenge yourself, not the other. You will develop confidence by facing your fears, and negative fighting spirit will become creative fighting spirit. The stress and pressure of serious Aikido training brings this spirit to the surface, exposing it so that it can be examined and refined in a controlled atmosphere of respect and mutual study. Discovering your physical limitations will cause you to reflect on the deepest meanings of harmony and conflict, and to strive for a level of consciousness above the selfish ego, closer to a universal consciousness. The physical movement of Aikido is the embodiment of the principles of the spirit. Negative force is not met with conflict, but joined, controlled and redirected through the power and and balance of spiral movement. 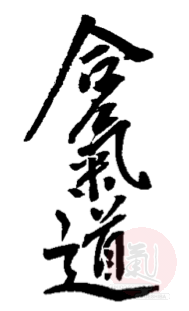 This is the shape of Aikido and the dynamic shape at the foundation of all the energies of existence. Aikido movement can only be understood from its roots in universal law and the processes of nature. Its sincere practice and study deepens our appreciation for the perfection of nature’s balance and brings us back into harmony with our environment, with other people, and with ourselves. Saotome Sensei is Chief Instructor of the Aikido Schools of Ueshiba, the Aikido Shobukan Dojo in Washington DC and the Aiki Shrine Dojo in Florida. He and his students have established many dojos in the United States and he conducts training camps and seminars throughout the country and abroad. The Aikido dojos he founded in Japan are still thriving and he has traveled there to teach and give demonstrations. He has given demonstrations of his art throughout the world. He is an artist working in calligraphy, painting and sculpture and his three books “Aikido and the Harmony of Nature,” “The Principles of Aikido” and “A Light on Transmission” (subtitled “The Teachings of Morihei Ueshiba, Founder of Aikido”) have been translated into many different languages.